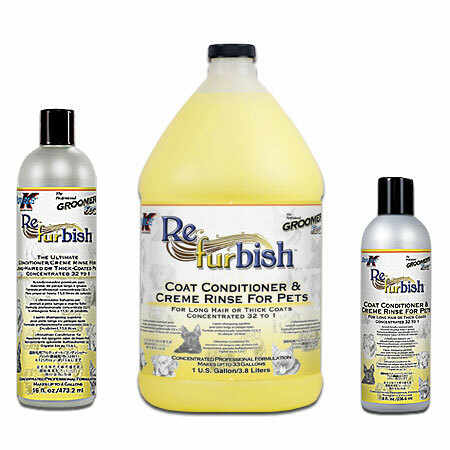 REFURBISH™ is the ultimate conditioner for long-haired and thick-coated animals! Loosens tangles to make comb-out easier. Helps loosen undercoat during shedding periods. Leaves hair silky and shiny. Enriched with Panthenol, Aloe and vitamins A, D, and E. For use on dogs, cats, horses and all other companion and farm animals. Concentrated 32 to 1. REFURBISH™ is a high quality, highly effective product for conditioning and is shipped in a concentrated formula that may be diluted at a ratio of up to 32 parts water to 1 part solution. The most effective way to dilute The Solution is to add it to a container that already contains water, and is only 2/3 full. This will provide an excellent environment to ensure that as the product is shaken or mixed it will dilute sufficiently. Refurbish™ 1 bottle of concentrate would make up to 5 gallons of conditioner. Now with the NEW REFORMULATED Refurbish™ 1 bottle of concentrate would make up to 33 gallons of conditioner.